- EGYPTE : Louxor - Two red granite statuary fragments of King Amenhotep III were unearthed this week at Amenhotep III’s (1410 – 1372 BC) mortuary temple on the west bank of Luxor. Dr. Zahi Hawass, Secretary General of the Supreme Council of Antiquities (SCA), explained that the first newly discovered artifact is a 2.73m tall head of the god Hapi. Hapi was one of the four sons of Horus and is depicted with a baboon face. The second object is a fragment of a larger statue of King Amehotep III, which features two legs that measure 30cm tall. 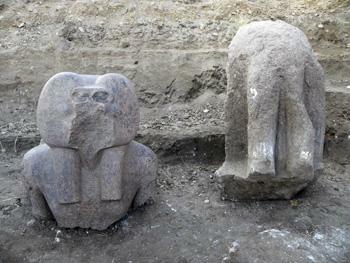 Excavation is now focused on unearthing the rest of these statuary fragments. Due to the large number of statuary found in this area, Hawass believes that the northern side of the temple may have served as a burial spot for broken and damaged statues. Because the statuary were ritually significant they could not be destroyed, instead Hawass believes that the ancient Egyptians gathered the fallen statues and buried them in a cache beside the temple. - TURQUIE : Istanbul - A large baptismal font unearthed during restoration work in the Hagia Sophia and dating back to the sixth century was shown to press members at a press conference. The baptismal font was positioned in a place in the structure that was closed to visits. It is made of solid marble. The font, which shows the cultural and architectural style of the Byzantium period, is still very strong and clean. 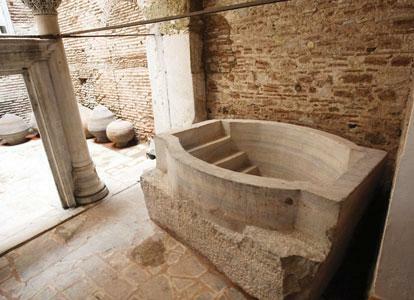 The Hagia Sophia’s Byzantine (Greek Orthodox) baptistery building had been turned into an Ottoman sultans’ tomb, and the sixth-century baptismal font in it was moved to the baptistery’s courtyard. The sultans who were buried in the tomb were those who had been dethroned. When Sultan Mustafa I and Sultan İbrahim were buried there, the baptistery turned into a sultans’ tomb and the baptismal font in it was moved to the court without being damaged. It remained under the soil. This court is a very beautiful section showing Byzantine art. Olive oil was used in baptism ceremonies in Byzantine Orthodox culture. Historical olive oil cubes and sarcophaguses were also unearthed in the court. As part of the restoration work in 2010, the baptistery’s courtyard was restored and the baptismal font was unearthed. - ROYAUME-UNI : Worcester - Archaeologists are busy unearthing Worcester’s Civil War past in the heart of the city. A dig is taking place in Lowesmoor, just metres away from the street King Charles II used to escape the Battle of Worcester in 1651. They have already exposed a huge ditch, found decorated 17th century tiles and a tiny coin that dates back to Charles I’s reign. Hal Dalwood, senior archaeological project manager, said the ditch stretching across the site was three metres deep and probably part of a bastion – an earthen defence constructed around the city walls in 1646 when Worcester was under siege. “They built these defences to protect St Martin’s Gate,” said Mr Dalwood. “What’s interesting about that is St Martin’s is the gate that Charles would have escaped through when the Battle of Worcester was lost. It all happened right here.” The bastion, known as St Martin’s Sconce, would have cut through people’s gardens and orchards. When the war was over, they simply pushed the earth mounds back into the ditches. It is one of these filled-in ditches that archaeologists are now excavating. - INDONESIE : Mentawai - A sunken ship that may be several centuries old and containing green and gray ceramics has been found off remote Indonesian islands recently hit by a tsunami. Fishermen who found the vessel believe the Oct. 26 wave off the islands lifted the 20-foot- (7-meter-) long ship from the ocean floor and pushed it closer to shore. Wooden ships laden with ceramic pots, golden necklaces and valuable spices for centuries navigated Indonesian waters, a key trade route linking Asia with Europe and the Middle East. The pots, jugs and bowls found still need to be tested to determine their origin and age, but they are similar to 14th century artifacts found inside sunken Chinese vessels. Local fisherman say they found the wooden ship after spotting its mast 6 kilometers from the beach off Pagai Island, hardest hit by the tsunami. 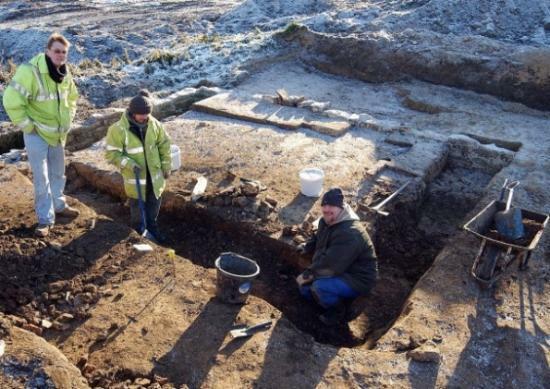 - ROYAUME-UNI : Pinchbeck - Experts braved sub-zero temperatures to unravel more historical mysteries at an archaeological dig in Pinchbeck. The dig unearthed more evidence of the original use of the site - with more of a stone wall and a pit and kiln the focus of attention. The finds so far are largely post 16th century in origin - but Allen Archaeology project director Kevin Trott said that he believes medieval remains will lie a foot to two feet below the surface - buried under soil and sediment from flooding. That would be the next step for 2011 but, with temperatures set to plummet once again, the site has been covered over to protect the limestone and brickwork from the elements. The next phase now will be to analyse what we have excavated so the work will continue, there’s a lot to do behind the scenes. The remains of the pit could point to it being where the waste was dumped from a large kitchen. This would add to the belief that the site is close to the home of a former moated manor - possibly even that of Earl Humphrey de Boun. The oven found could have been for bread or milling while stone walls could have formed part of a small. Experts believe that they are working on land very close to the manor - which is thought to have once resembled Gainsborough Hall in the north of the county. More than 5,000 artefacts have been taken to Lincoln by Allen Archaeology for analysis. - JORDANIE : Mer Morte - Russia and Jordan have signed an agreement to search the bottom of the Dead Sea for the remains of the Biblical cities of Sodom and Gomorrah. Biblical archaeologists have several theories as to where the Sodom and its associated cities were located. According to the Torah, G-d overturned Sodom, Gomorrah, and three other cities because of their degeneration, sin and iniquity, turning a once fertile plain into a stark wasteland. Abraham, who prayed for the cities, was unable to prevent G-d from mandating their destruction. Archaeologists and geologists have suggested that a major earthquake or meteor storm might have been the means by which it occurred. Research has centered on the area around the Dead Sea, and the modern city of Sodom, and nearby Mount Sodom, which is made almost completely of rock salt, is considered the most likely site of the ancient cities. However, some archaeological evidence has emerged that indicates that the site could be on the east bank of the Dead Sea, with two sites in Jordan - Bab edh-Dhra, and Numeira, both considered viable candidates. The Jordanian-Russian search will center on Bab edh-Dhra, which also has several Christian monuments. Further evidence that the cities remains are located on the Jordanian side of the Dead Sea came after recent NASA photographs of the area indicated that the bottom of the sea is littered with debris and objects not found in other bodies of water. According to the Jordanian, Israel recently sent a submarine down into the Dead Sea in an attempt to explore the bottom of the sea, but discovered that the objects in the NASA photos were on the Jordanian side of the sea. Jordan prevented the Israelis from searching over the border, and now Jordan is seeking to discover what it believes are the remains of the cities by itself. - ISRAËL : Césarée - The storms also caused severe damage to archeological and antiquities sites up and down the country’s Mediterranean coast, most seriously at the Herodian port city of Caesarea. Experts say the cost of restoring the sites will be in the millions of shekels, but in many cases the losses are irretrievable. 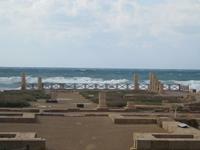 Caesarea, where Herod the Great constructed one of the biggest ports in the ancient world between 22 and 10 BC, was hit particularly hard by the storm. A 1950s-era breakwater built off the coast of the site to protect it from the natural force of the sea broke up into three pieces during the storm, and the result was devastating. In all of the ancient city, areas from the Hellenistic period and especially the areas from the Roman and Byzantine times, large parts of it have been destroyed. The crusader city wall in the north, part of it fell down, the Herodian wall in the north something like 40 meters was destroyed, and there are a lot of new cracks. Part of the aqueduct and also the coast next to the main aqueduct was washed away and disappeared.In the southern city of Ashkelon, a large section of a cliff, over which ancient ruins including mosaics and a bathhouse sit, was washed away. In the northern city of Acre, Israel’s Antiquities Authority had in the last two years begun reconstruction of the southern city wall. During the recent storm, this proved to be the site’s savior. Most of the damage incurred by the coastal sites was the result of erosion caused by the huge surge of waves whipped up by the storm. - BULGARIE : Vratsa - The oldest temple of the Sun has been discovered in northwest Bulgaria, near the town of Vratsa, aged at more then 8000 years. The Bulgarian 'Stonehenge' is hence about 3000 years older than its illustrious English counterpart. But unlike its more renowned English cousin, the Bulgarian sun temple was not on the surface, rather it was dug out from under tons of earth and is shaped in the form of a horse shoe, the report said. The temple was found near the village of Ohoden. According to archaeologists, the prehistoric people used the celestial facility to calculate the seasons and to determine the best times for sowing and harvest. The site was also used for rituals, offering gifts to the Sun for fertility. This area of Bulgaria was previously made famous because remnants of the oldest people who lived in this part of Europe were found. Archaeologists also found dozens of clay and stone disks in the area of the temple. The semantics of the disks symbolise the disk of the Sun itself, which means that this is the earliest ever temple dedicated to the worship of the Sun God, discovered in Bulgaria. - VIET-NAM : Khuoi Nang Cave - Ancient artefacts, from a prehistorical culture dating back 4,000 – 7,000 years; have been discovered in a cave in the northern province of Ha Giang’s Bac Me District. Two tombs have been excavated in the Khuoi Nang Cave. Archaeologists said one of the tombs contained bone fragments and teeth from an adult, while the other had the remains of a child. The adult’s grave also contained stone tools. In addition, Archaeologists have found hundreds of stone tools in the cave, including hatchets, hoes and knives, together with lots of ‘red stone powder’. It is believe that this red power is painted onto the corpse, so that the decease person reaches the ‘afterlife’. Khuoi Nang is the residence of prehistoric people, dating back 6,000-7,000 years ago. Prehistoric human culture was in existence 10,000 years ago. - ROYAUME-UNI : Somerset - The Iron Age inhabitants of Somerset’s Avalon Marshes might have thought prehistoric architects were at work if they could see designs for the striking thatched visitor centre proposed for their old homeland. The conical thatched buildings have been dubbed a “flotilla of coracles” by the partnership, including Natural England, which is planning the scheme. The marshes are a network of wetlands of international importance for wildlife and archaeology. The remains of Iron Age houses lie under bumps in fields near Glastonbury, while an ancient log boat, pelicans’ bones and prehistoric wood and hurdle roads still lie in the peat.